Who were the First Nations of our region and how did they play a pivotal role in shaping Canada, our history, and our cultural identity? Discover the, “Wilderness Empire: A Story of the Iroquois Confederacy,” as author and historian Michael Hart presents on the the Haudenosaunee and their central place in the story of our nation. 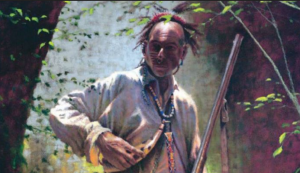 This is a story of the rise and fall of the wilderness empire of the Iroquois Confederacy. This is a story of powerful Indigenous confederacies and alliances, and the struggles for territory and dominance between Indigenous coalitions and the empirical powers of the Netherlands, France, and Britain in eastern North America. Central to this story are the five tribes of the Mohawk, Oneida, Onondaga, Cayuga and Seneca. Centuries before Europeans found their way to eastern North America, the five tribes accepted the message of the Great Binding Law brought by the Peacemaker, declared an armistice among themselves, and became known as the Haudenosaunee Confederacy. This is a story of how the Haudenosaunee Confederacy, later known as the Iroquois Confederacy, won a wilderness empire through military power and political prowess. This is also the story of how, confronted by overwhelming pressure from European encroachment, the Iroquois fell from princes of wilderness empire to refugees in their ancestral lands. This is a story of intelligent military strategy and bold diplomacy of Indigenous leaders that altered the history of European empires and shaped the cultural and political landscape of present-day eastern North America. New Brunswick Roots singer-songwriter Mike Biggar brings his 2017 Acoustic Christmas tour to The Black Irish Bistro in picturesque Gananoque for an intimate evening of heartfelt original holiday songs and beloved Christmas standards as featured on his multi award-winning soulful album THE SEASON. 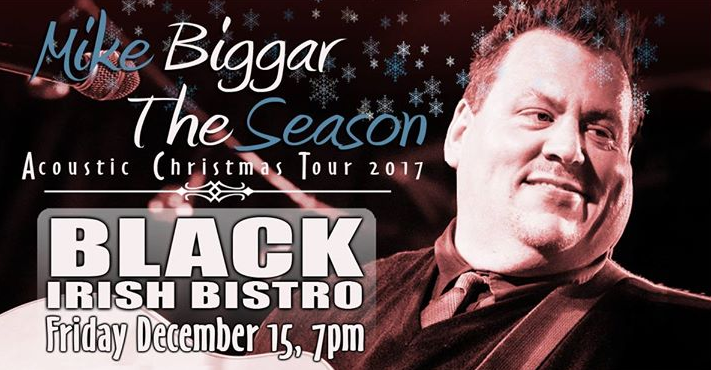 Joined by his musical friend Sandy MacKay, Mike’s acoustic duo concert will showcase songs of the Christmas season in his signature soulful, bluesy roots styling…and the show is bound to include lots of disarming humour and stories from this award-winning artist! 7 Area Choirs performing several of their favorite Christmas Carols. 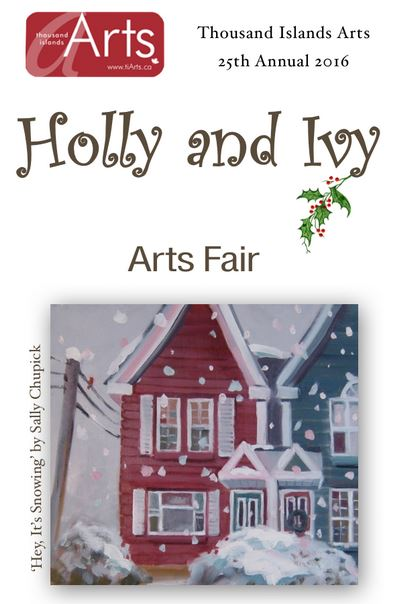 All proceeds go to the Gananoque and Area Food Bank. Admission at the door. Adults $10 Children $5, Family $25. (max). Celebrate the season with family and friends this Christnas Eve by starting at Muskie Jake’s Tap & Grill. 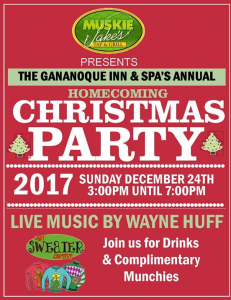 A long tradtion of meeting up with old friends and family, We invite you to join us for complimentary munchies and Live Music by Wayne Huff! Festive drink menu will be available and be sure to wear your Ugly Sweater for a chance to win some great prizes! Come experience the glorious new ROYAL THEATRE THOUSAND ISLANDS in beautiful Gananoque, Ontario as BRING THE PIANO, Randy Vancourt’s one-man musical comedy about the travails of a travelling musician, comes to town! 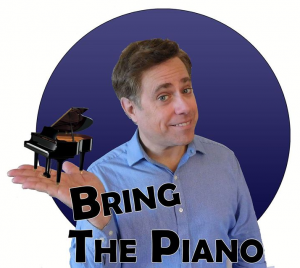 BRING THE PIANO, RANDY VANCOURTs one-man musical comedy about the travails of a travelling musician, is coming to the Royal Theatre Thousand Islands. Performances run from July 5, 2017 at 7:30 PM. Randys diverse career includes being a performer with the Second City, a puppeteer with The Muppets, writing and performing theme songs for numerous TV series, and starring in multiple productions of his award-winning, long-running musical Chutzpah à Go-Go. BRING THE PIANO follows his true adventures touring his solo music and comedy act across North America. From mistaken identity in the Yukon to narrowly avoiding a South Pole sinking, unusual situations seem to follow him wherever he goes. Randy was Musical Director at the Brockville Arts Centre for several summers and also composed the score for their production BUNCH OF MUNSCH. He appeared on stage there in SOPHIE TUCKER as well as his own musical, BOARDWALK! The Doo Wop Show. Show info, bio, photos, video and audio are all available on the show website at www.bringthepiano.com. RANDY VANCOURT at vancourt@gmail.com, or 416-535-5149. 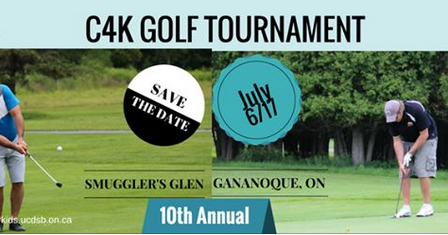 The 2017 C4K Golf Tournament will be held on Thursday, July 6, 2017 at Smuggler’s Glen Golf Course in Gananoque. Cost is $150 per golfer. Cost includes golf fees, cart, BBQ lunch, dinner (buffet – prime rib, chicken and salmon available) and $20 charitable tax receipt. Tickets may be purchased for the dinner only at a cost of $40/person. Jenica Rayne is a professional singer-songwriter, accomplished guitarist, seasoned performer, and passionate music educator. Rayne’s thought provoking songs are about personal and social consciousness. They artfully combine pop melodies with the lyrical sensibilities of the singer-songwriter genre and the storytelling of roots. She has released a number of critically-acclaimed CDs. Young Maggie Sinclair is a free spirited flowerchild. 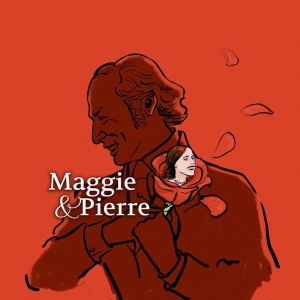 Pierre Trudeau is nearing 50, urbane, charismatic, and the future Prime Minister of Canada. When this unlikely pair finds one another, they fall in love, and dominate the international media for the next decade. This Canadian classic is a tour de force one-woman play about the pressures of power and fame under the media spotlight. Regular Council Meetings are held the 1st and 3rd Tuesday of each month at 6:00pm. Most meetings are conducted in the boardroom at the Emergency Services Building at 340 Herbert Street, Gananoque, ON – any changes will be posted on the Town’s website. This page only displays the current year’s Council meeting information. To View archived meetings’ agenda, backup material, or minutes please scroll to the bottom of this page and select the desired year. If searching a specific item go to the top of this screen and use the search engine provided by typing in the subject matter be sought – this will search across all years. The Council Agenda is in an electronic interactive format. The supporting material for the Council Agenda is linked to the Agenda and appears as a paper clip – also attached is a draft motion that Council will be considering. To view a specific report or item on the agenda, open the Agenda then double click on the paper clip beside the desired item; or right click on the desired paper clip and then click on “Open File”. Holiday Containers Diane Huddle will help you beautify your home’s exterior. Carveth Care- Herbert St. Entrance 375 James St. This workshop is perfect for students who have never taken a yoga class before or have taken a couple classes but just aren’t getting it. Learn about what yoga might mean to you – mind and body. Let’s quiet any of those ideas that might make yoga seem intimidating to you. 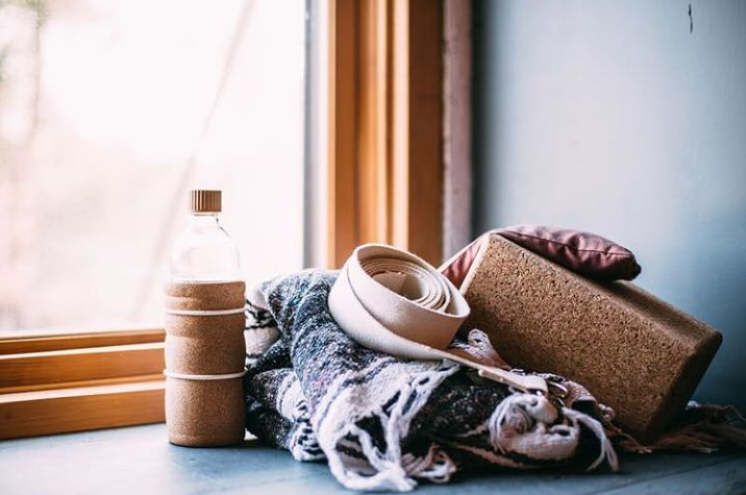 The first part of the workshop focuses on what yoga is, various breathing (pranyama) techniques, the importance of stability and understanding how your body moves. In the second part of the workshop we discuss key postures (asanas), learn how to safely move into each one and how to effectively use props. Lastly, you will participate in a 1 hour yoga class. Previous owner of The Ledger Room, currently teaching at The Ledger Room, graduate of Amara Vidya Yoga. Cost: $40 which includes 2 weeks of unlimited yoga. Registration is required. You will leave this workshop with a good foundation allowing you to feel comfortable in regular group yoga classes. 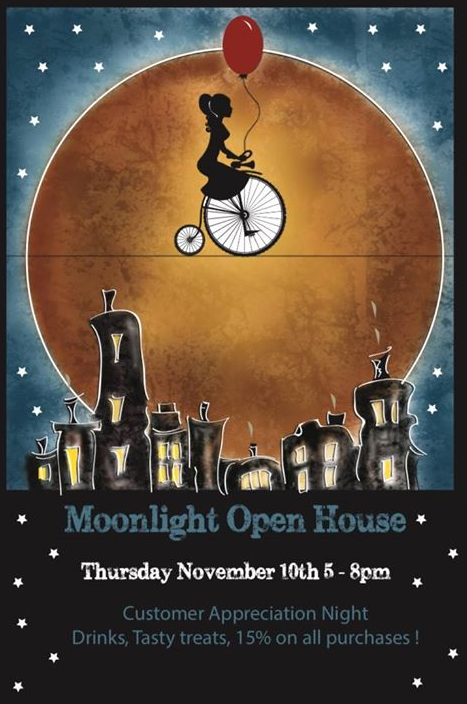 It’s that time of year – it’s Moonlight Open House!! We celebrate women in business and celebrate the customers that support our local shops. Join us for our annual customer appreciation night. Visit any of the participating stores ahead of time to pick up your ballot/passport card. Ballots will be ready for pick up as of Tuesday October 25th. On the eve of, stop by particpatng stores to get your passport stamped (no purchase required). Also take a moment to enjoy treats, drinks and 15% off any purchases. Your passport is your ballot for the grand prize draw. The grand prize draw happens 8:30 at the The Socialist Pig: food for everyone as usual. Join us on Sunday, November 13th at 1:00 p.m. for our community conversation “The Choice is Ours: A Local Perspective on Global Climate Change” at Gananoque Public Library. Thousand Islands Arts (tiArts) is an umbrella organization of artists, artisans, patrons and business partners from the Thousand Islands region. 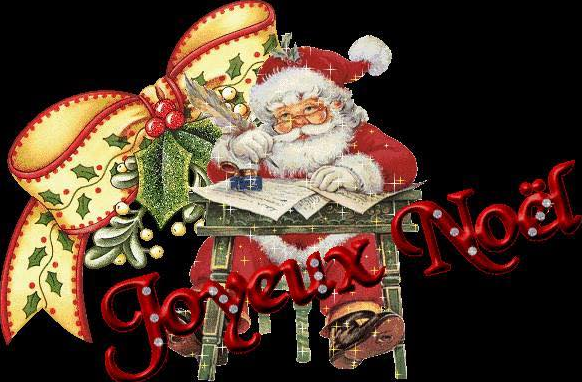 2016 Annual Gananoque Santa Clause Parade Admission Details: Admission is free. Local retailers will be offering free coffee, hot chocolate and snacks during parade. 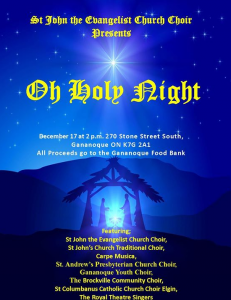 We will be collecting donations for the Gananoque Food Bank. 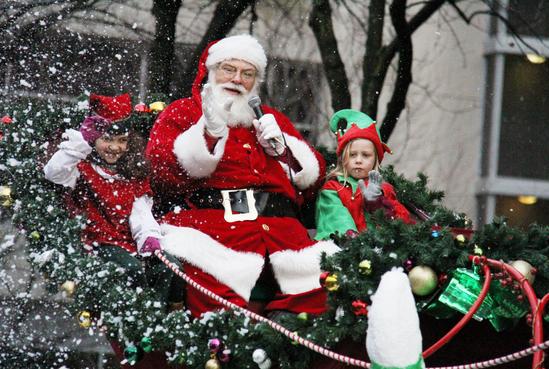 Santa and a couple of his reindeer will be in the park following the parade to meet with children and to hand out some presents! There will also be a couple of the bands staying to entertain us so get your caroling voices tuned up for a fun evening to set the holiday spirit! 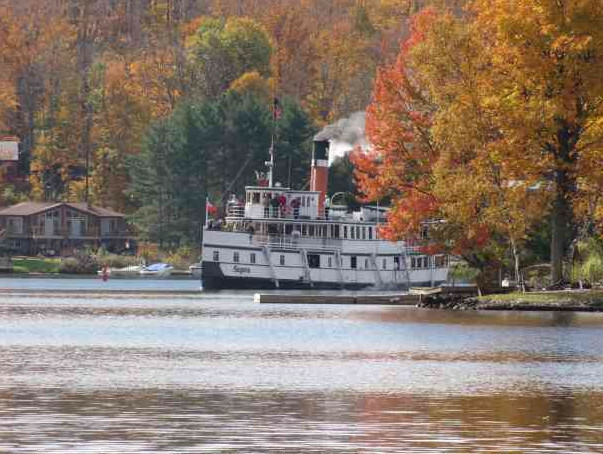 It’s time for a scenic fall colour boat cruise in Ontario. If you’re like us, you never tire of that annual rite known as the fall colours. It’s when forests and meadows and treed boulevards turn from green to a riot of reds, yellows and oranges. It’s the colour of happiness, though tinged with a bit of sadness because after all, this display of natural beauty leaves little doubt that summer, alas, is truly over. If you’re like us and love water, you’ll want to fit a cruise into your 2012 leaf-peeping tours. The combination of fresh air, vivid colours and shimmering waters is truly good for the soul. To help you set your compass, we’ve compiled a list of some of our favourite fall colour boat cruises in Ontario. 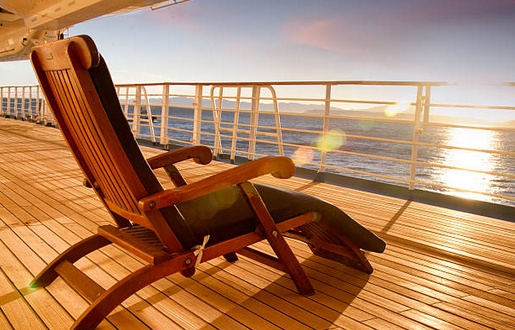 The most popular cruises are booking up fast, so don’t wait to make that reservation! Dinner includes: Turkey, stuffing, mashed potatoes, hot seasonal vegetables, cranberry sauce, mixed green salad, pumpkin praline pie and coffee or tea. $52.50 per adult with meal or $36.50 per adult without meal. The date for the eighth annual Chalk the Walk festival has been announced! 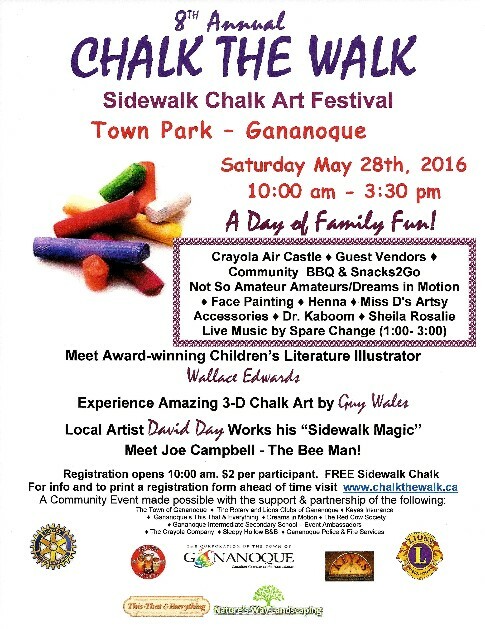 Join us in Gananoque on Saturday May 28th, 2016. Our 8th year for this fun family event that is the community kick off to the arrival of Spring. Entertainment, Live music, BBQ, Air Castle, Face Painting,National Award-winning children’s Artist/author Wallace Edwards, well-known local artist David Day and 3-D magic of Guy Wales and more! Come out and show off your Sidewalk Chalking skills! Admission Details: Register at 10:00am. Each participant is $2.00 includes a package of sidewalk chalk, and a certificate of participation. – Meet Joe Campbell – The Bee Man! The seventh annual 1000 Islands International Sidewalk Chalk Art Festival was held May 23, 2015. It was a fun-filled family event showcasing art for all ages. Many types of art were on display, including sidewalk chalk art, paintings, drawings, and fine art. Visitors made their own art, enjoyed a good old-fashioned BBQ, and had their faces painted. There were special activities just for children. To print-out the registration form, please click here. Gananoque Town Park 30 King Street East,at the intersection of Park St. and King Street. A popular day for gifts of flowers and greeting cards. 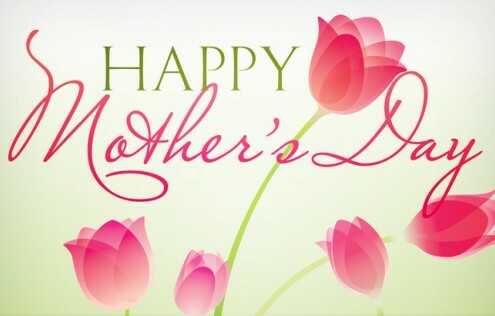 Many people in Canada express their gratitude towards mothers and mother figures on Mother’s Day. It is the time for people to thank mothers and mother figures who took the time care for them and help them through life’s challenges. Carnations are a popular Mother’s Day symbol in both Canada and the United States. Some people may choose to wear a carnation as a brooch on Mother’s Day. 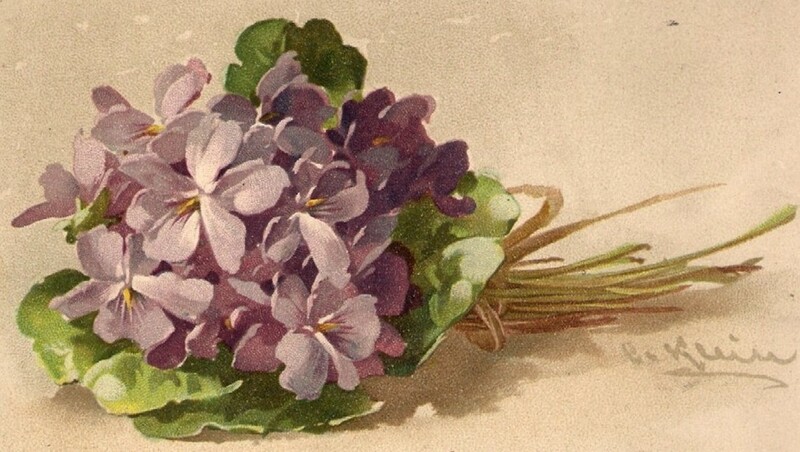 However, other flowers are also given to mothers or mother figures to symbolize one’s love and appreciation for them.